Common hackberry or American hackberry (the names are used interchangeably) is a member of the elm family (Ulmaceae). 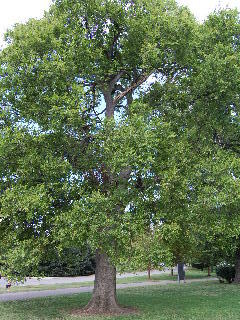 The form of the hackberry tree also resembles that of the elm, both having rounded crowns and large arching branches. The wood of the hackberry is unimportant in the timber industry—tending to be rather brittle with the grain being somewhat twisted and unattractive. It is sometimes used in the making of pallets or for backing in some furniture applications. For the woodlot owner, the wood is dense enough for firewood and it often finds utility as such, along with oak and hickory. As for its place of practicality in the landscape, the hackberry tree is, unfortunately, a bit under rated. Although it doesn’t get a lot of praise and glory like the maples, it does occupy the place of a reliable cog in the big machine of green glory. Which means it is a rather fast growing and undemanding shade tree that works quite nicely in the homeowners landscape and will survive in the midst of less than ideal growing conditions. The hackberry tree is also quite drought resistant, which makes it a good species to plant not only for the homeowner but also for municipalities seeking to add fast growing, low maintenance, undemanding shade trees to city streets and parks. If there is a drawback to adding this tree into the landscape, it is the fact that as the hackberry grows and matures, the spreading of the heavy limbs of the trunk may cause splitting or the development of cavities in the wood that can lead to decay or shortened life of the tree. Otherwise, the hackberry is a perfectly fine shade tree that goes about its business without a lot of razzle-dazzle. Just give it a site with plentiful sunshine and make sure it has enough room to reach out and up. Under ideal uncrowded growing conditions, a healthy hackberry tree can spread its branches to 60 feet outward and reach heights of up to 70 feet and more. Now, before you yawn and fall asleep at the lack of glamour of this species, let's go ahead and look at a really interesting feature of the hackberry tree--the bark. The coloring ranges from light gray to silver. 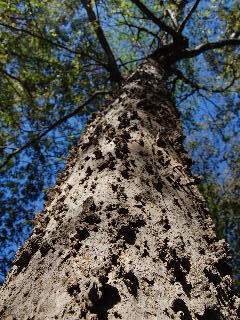 Noteworthy is the fact that, as the tree grows, it begins to form characteristic warty growths in no particular pattern or density on the surface of the bark. These blotchy growths usually occur more heavily toward the ground and become less concentrated on the upper reaches of the tree. Just as unpredictable as the pattern of these warty growths is the fact that some hackberry trees have almost no warts at all but rather an almost smooth skin. Pretty exciting, huh?! The fruit of the hackberry tree, which is small (pea-size) berries that ripen to a dark purple in the fall, is a favorite food of wild birds. The berries are not poisonous to humans and can be consumed. They are said to have a rather mild and somewhat dry taste. Historically, they were used by the Native Americans for food and for medicinal purposes. So, don’t be afraid of the hackberry trees. They demand little and give much.